Ready for a treat? I really think you’re going to absolutely LOVE this! So easy, so simple, and with every day ingredients you probably already have in your pantry. 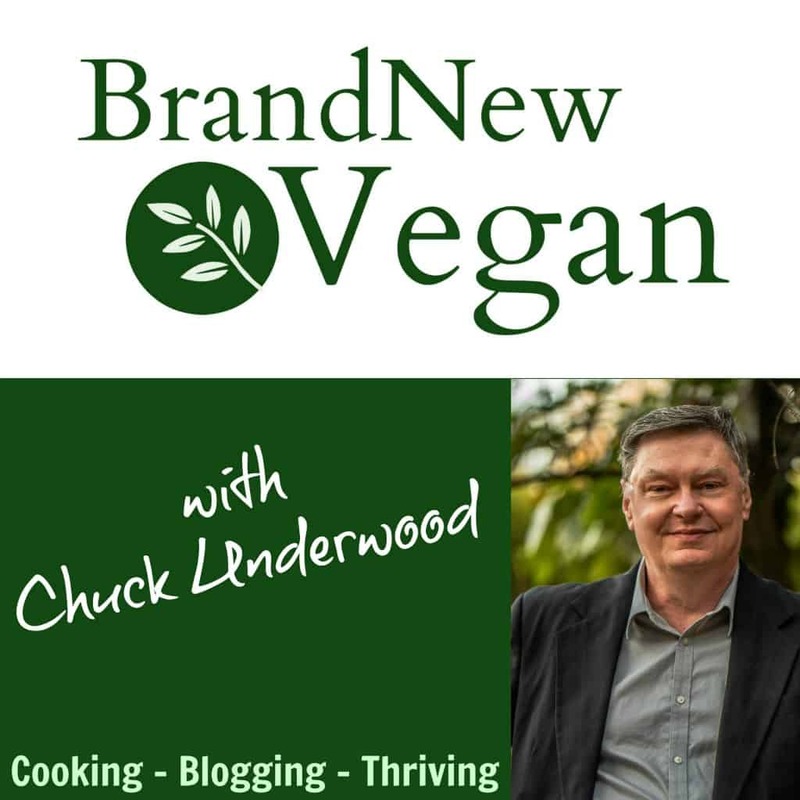 It seems our modern-day Buddha Bowls derived from the ancient practice of begging for alms. Every morning Buddhist Monks would go house to house with their one and only possession – their “Alms Bowl”, or “Gratitude Bowl”. They would walk single file, oldest first, carrying their alms bowls in front of them. Laypeople would wait for them and place food, flowers or incense sticks in their bowls. As most monks were vegetarians – food would usually be in the form of rice or vegetables. The householders would be blessed by the monks, and the monks would have food for the day. What I like about this story is I can almost feel the gratitude. Gratitude to have food on the table; gratitude to be happy with simple, nourishing foods; gratitude of being able to give and receive. And a Thai Peanut Sauce from my Easy Peanut Noodle Recipe. Simple, easy, nourishing, and delicious. The perfect meal after a long day at work. In a small pan heat ½ cup of Soy Sauce (use the low sodium variety) and ½ of water. Toss in a good amount of minced garlic – I use 2-3 big cloves – because I LOVE garlic. Stir in 1 Tbls of Rice Vinegar, ¼ tsp of ground Ginger, and for a little kick add ½ tsp Chili Garlic Paste and/or 1 tsp of Sriracha. Now slowly add up to 1/3 cup of your favorite Peanut Butter and whisk until it’s combined and smooth. It will automatically start to thicken as it heats up. This is a good time to take a taste. If you like your sauce a little sweeter – add either 1 Tbls of Hoisin Sauce or 1 Tbls of Brown Sugar – tasting as you go – until it’s just right. I like a full Peanut flavor, with just a hint of sweetness, and a mild spicy kick from the Sriracha. You could also add in some Red Pepper Flakes to give it a bit more zing. 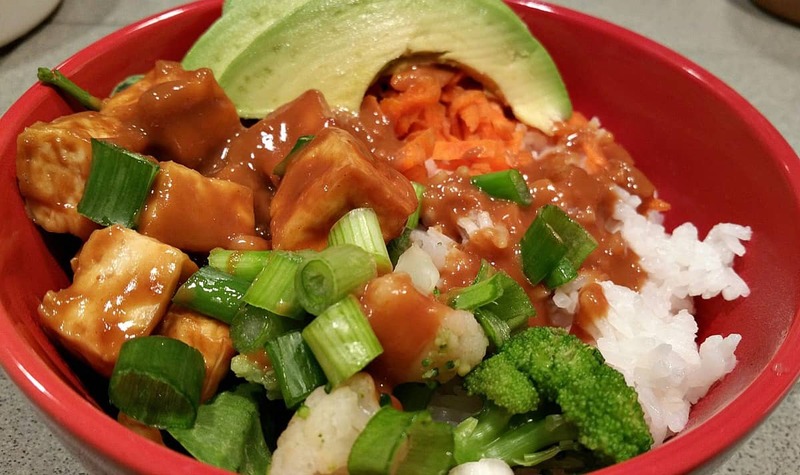 There are may ways to add Protein to your Buddha Bowl – I used baked Tofu. You could easily use Beans or Chickpeas instead. For the Tofu: remove your block from the package and drain all the water. Then wrap the block in some paper towels and cover with a heavy object. I used my cutting board and placed a cast iron skillet on top. Let it sit and press for about 15 minutes while you preheat your oven to 400° F. Replace the wet paper towels about halfway through the press time. After pressing, slice your tofu into cubes and place on a parchment lined cookie sheet to bake for about 25 minutes. 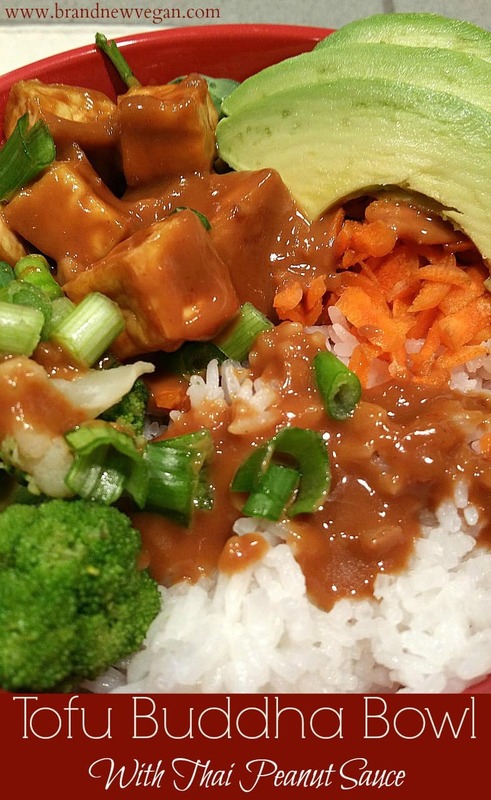 After baking – place your Tofu Cubes in a shallow bowl and add some Peanut Sauce. Toss well and be sure they’re evenly coated. Let that marinate while your prepare your Buddha Bowls. To prepare your Buddha Bowls, first you need to select your bowl. My bowl holds about 3 cups of liquid. Once you have your bowl – simply line the bottom with fresh spinach. Kale can also be used. Top that with a combination of raw or cooked veggies, shredded carrot, steamed broccoli, cauliflower, etc. I just want to thank all of you for your lovely comments and kind words. I especially want to thank those of you who have donated money to my blog. It will be well spent and I just want you to know how grateful I am. The job hunt is continuing and hopefully I’ll have some interviews coming soon. Thanks everyone – you’re amazing! 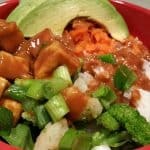 This Buddha Bowl is a hearty bowl of fresh veggie goodness, including a helping of rice and some baked tofu marinated in a Thai Peanut Sauce. Healthy and nutritious. Drain Tofu and press between paper towels to remove as much moisture as possible. I used a cutting board and a cast iron skillet on top. Let press for 15 minutes. Dice tofu into cubes and bake for 25 min. 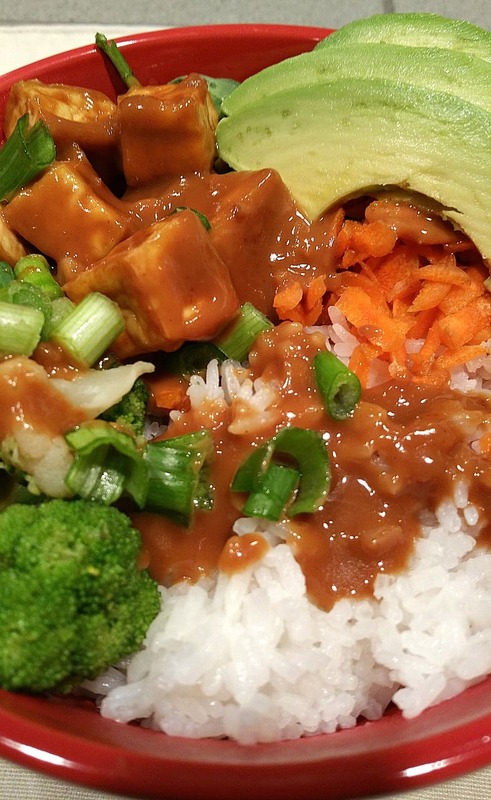 After baking, place Tofu in small bowl and add a little Peanut Sauce (when finished) to marinade. Prepare sauce by heating all ingredients in small pan until thickened. Prepare Buddha Bowls by lining a large bowl with fresh spinach - just enough to over bottom. Add rice - as much as you want - probably about halfway depending on size of bowl. Drizzle with Peanut Sauce and enjoy! This sauce is outstanding! So delicious. Highly recommend it. And a little bit goes a long way so you don’t need to worry about the sodium and fat. My favorite Buddha Bowl! Quick to prepare and so yummy! A good Sunday night meal!